To finalize your landscape, you would need to add to or change out your garden plants. You could have well established perennials or change annuals every year. There are many directions you can take to establish your garden and calling the Grapevine Lawn Guys to assist you with your garden needs is just a phone call away. Annuals – is a plant that completes its life cycle, from germination to the production of seeds within one year, then dies. Summer annuals germinate during spring or early summer and mature by autumn of the same year. Perennials – Horticulturists usually categorize perennial plants into two types: Woody plants and herbaceous perennials. Woody plants are trees, shrubs, and vines whose above-ground parts persist over the winter, and resume growth in the spring. Woody plants will grow much longer than 2 years. Perennials, particularly small flowering plants, that grow and bloom over the spring and summer. Perennials die back every fall and winter, and then return back in the spring from their root stock, are also known as herbaceous perennials. Mulching not only helps to create healthy lawns but also has a visually aesthetic value as well. The right colored mulch that complements the exterior colors of your home and surrounding landscape. Grapevine Lawn Guys offer premium planting and mulching services. For example, brownish/red pine mulch goes well with brick houses. Dark mulch can contrast with flowers, improving your landscape visibility and design. Mulch also can be used to enhance your landscape theme and setting. 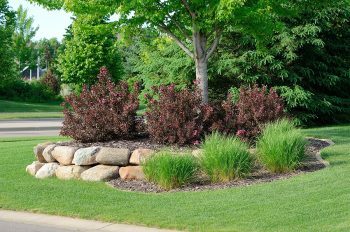 Some landscapes have large areas of mulch with a few shrubs scattered around. Grapevine Lawn Guys design your landscapes so your shrubs cover all of the soil and you have complete vegetative cover. Clean out old mulch – Removing some of the old mulch that is rotting or has become moldy. Sometimes mulch has been layered and added to the beds a few times. Some mulches do decompose, but that decomposition may not happen for a few years. Clean up of the mulch that has built up over time should be done every year. Trying different mulches – There is a few texture options such as pine straw and shredded hardwood bark. Empty Spots – Having bare soil on your property leads erosion and runoff. Bare soil loses about five times as much sediment than with mulch. Use with your trees – Using mulch around your newly planted trees provides insulation and protection from invading plants. Don’t use too little or too much mulch – About 3 inches of mulch is recommended for beds. Mulching with the right amount each time will help defend against weeds and conserve water. If you use pea gravel mulch or inorganic mulch just use two inches. Mulch barriers for some types of mulch – Adding a layer of plastic or landscape fabric could cause more water runoff and keep your garden from having a clean, streamlined look. Often landscapers want to use plastic or landscape fabric to separate certain mulches from the soil. If you use an organic mulch that will break down, like shredded hardwood bark, avoid landscape fabric because you want the mulch to be in contact with the soil to improve it. Plastic or landscape fabric could prevent water and rain from reaching the soil. Now that you have the lawn maintenance squared away and those bushes trimmed, its time to complete planting your annuals and perennials. Grapevine Lawn Guys have the knowledge to not only build your garden beds, but also plant your annuals and perennials in those gardens. For those who need help with designing and planning, please waist not time to call us.